Add Weather & Graffiti Protection (POF)--Only $14.95! 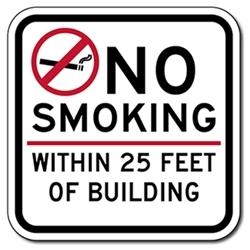 DOUBLE the working life of your No Smoking Signs by adding 3M Protective Overlay Film (POF)! 3M’s high-tech POF protects sign faces against fading caused by the sun and harsh weather—and makes graffiti and sticker defacement damage easy to clear away without harsh abrasives. California Government Code 7597: Smokers must be greater than 20 feet from a public building’s entrances or operable windows while in the act of smoking. This doesn’t apply to portions of the building that don’t have operable windows, doors, or the like. You should also consider posting signs near any HVAC air intake vents. Smoking in the workplace: Although there is no federal smoking ban for private employers, 47 states have laws limiting smoking in public places, including workplaces; 40 states and the District of Columbia restrict smoking in private-sector workplaces; and all 50 states restrict smoking in government buildings. Local jurisdictions also have banned smoking in public indoor areas, often including restaurants and bars. In states where smoking is confined to designated smoking areas, nonsmokers cannot be required to enter the area.